For many people, one of the most important things to do in Cozumel is get in the water as quickly as possible, whether attached to a scuba tank or sporting snorkel gear. And, this is not surprising. Rivaling Grand Cayman, Belize and Roatan, some of the very best underwater experiences can be found in Cozumel, and local bars, restaurants, kiosks and outfitters can supply everything that a beginner or experienced underwater adventure seeker may need. But, with so many providing underwater Cozumel tours to anxious travelers, it’s a good idea to stick with the best of the best in terms of sea submerging Cozumel excursions to ensure that your time underwater is enjoyable. 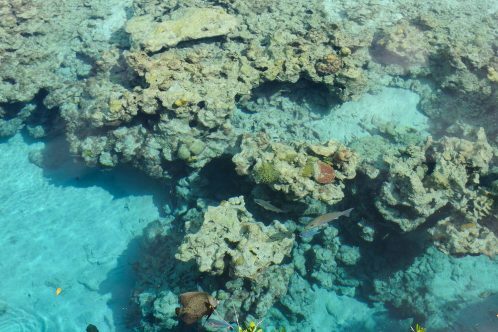 Since many stick to snorkeling on their first visits either because they lack the certification or training needed for scuba or are traveling with small children, it’s worthwhile to look at the best snorkeling Cozumel tours in the area, starting with Mystic. It’s rated excellent by a boat load of travelers and features intimately sized groups (up to ten) and typically offers a good blend of both cruise ship passengers and local vacationers. The guides from Mystic take photographs during the Cozumel tour that can be purchased following the adventure. Snorkel sites are normally reachable via short boat ride, and the friendly and knowledgeable guides are known to provide refreshments to and from the destination. Another benefit to the excursion options provided by Mystic is that unlike many Cozumel tours, they can be booked by individuals and don’t need to be booked through the cruise line, which can make them more affordable. And, although one of the biggest threats facing passengers of Western Caribbean cruises is the ship leaving without adventurous guests, the staff at Mystic is very cognizant of tight ship schedules and ensures that passengers arrive back on time. Just below the water’s surface, snorkelers are treated to a colorful and vibrant array of sea life including many fish species, turtles and stunning coral features. These natural wonders are emphasized to visitors who are guests of Two D’s Diving and Tour Adventures, where Deanna and Company make dreams reality by providing unique and engaging underwater Cozumel tours. Two D’s features incredibly friendly and knowledgeable staff that caters to first timers and new visitors. Refreshments are offered en route to one of numerous dive sites used by Two D’s, where starfish, turtles and abundant fish are on full display. Two D’s also offers scuba diving options, for which the outfit is perhaps better known. Scuba based Cozumel tours are some of the most well loved in the area and an absolute must for anyone who is certified in diving. The dive masters and captains affiliated with Two D’s are some of the very best in the area, combining years of experience with a wealth of local knowledge. One additional benefit for passengers of Western Caribbean cruises is that many of the tour operators and employees speak English very well, making communication easy and enjoyable. Scuba diving on one of the many great Cozumel tours is a blissful experience, especially in well known areas like Palancar reef, which is a part of the Mesoamerical Barrier reef, second only to the Great Barrier Reef as the longest in the world. Visibility can reach up to two hundred and fifty feet here, making it one of the most immersive and spectacular adventure tours in all of Cozumel. The La Cieba Reef doesn’t fail to amaze divers as well, and it features a stunning anomaly among other underwater Cozumel tours. An airplane direct from a local disaster movie is sunken here, following its explosive filmed demise. Aldora Divers is well known in Cozumel amongst serious scuba fans and they’re sought out for their fast boats and steel tanks. While Aldora Divers and popular dive master Rachel is well suited for seasoned scuba-ers, beginners and early learners will benefit immensely from the trained and knowledgeable staff at Aldora that keep guests feeling safe and secure throughout their journeys. Aldora tends to tailor each experience to make sure that shark enthusiasts get a view that really bites and coral fans get a taste of some of the most calcified Cozumel tours the area has to offer. For many, Western Caribbean cruises just aren’t complete without some time spent in the water clad in scuba gear or toting a snorkel. There are many excellent excursion companies to consider, and which is right for you will depend on the individual experience that you are looking for.